When I'm fed up with the usual rules of the boardgame Blokus, I'm making variations of it. Here is one I recently come up with. The board is of size $(20*20)$. 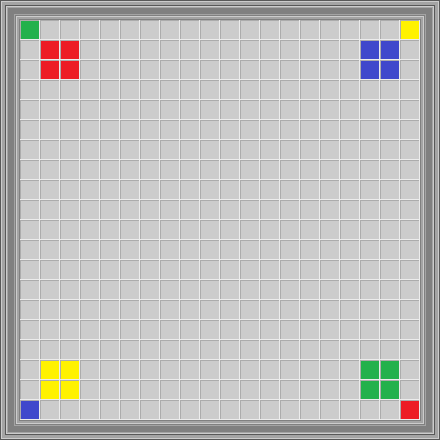 The starting position in the board is the following : each player has his monomino (dot piece) already placed on the corners of the board, and their 2x2 square is placed on the other side of the board, touching the dot by the corner. To succeed, a player must redirect the flow from his dot, to his goal, the 2x2 square. The flow starts by leaking out of the 2 sides of the dot, it can't be obstructed, and the flow cannot go back in the dot. 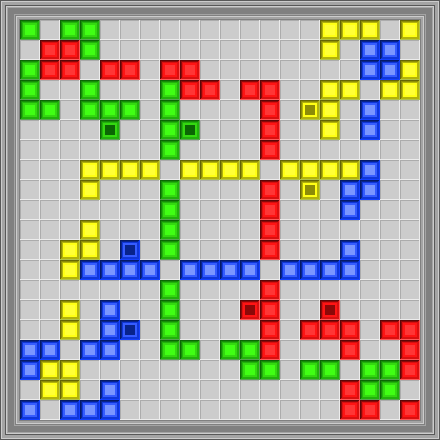 The flow have to jump over one unused tile to reach another placed piece of the same color. If it can't go forward, it will look to the left and the right. and will turn towards an "own color" square. If the flow can go both directions, it will split (with one exception). if the flow is currently in a jump tile and it doesn't land on a piece of its color the next tile forward, the flow is lost. and if it jumps and lands on a wall, it's lost too. 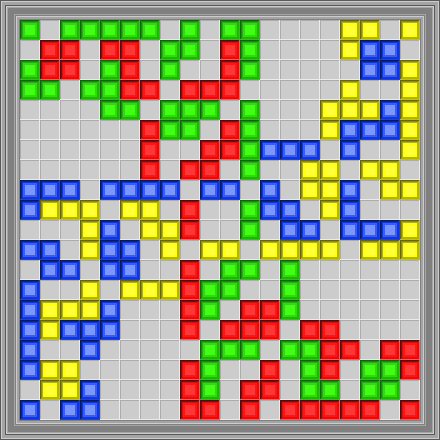 flow of different colors can jump over the same unused tile. 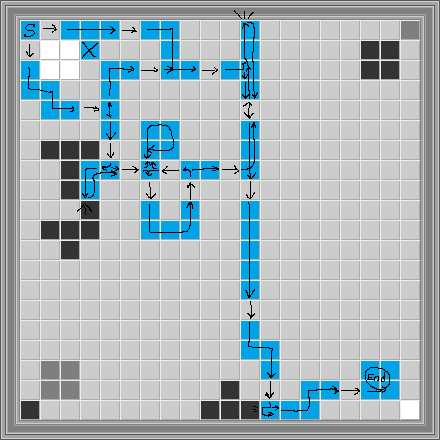 After landing on a new piece, if the flow can't go forward on the next step, it will split to the left and right, even if there are no blocks to be seen. Here is an example of how one player can reach his goal, using the above rules. In the above picture, there is a square (marked with an X) where no flow is passing by, this counts as waste. Also, when some landing split occur, I can use the others colors to redirect back the flow, even if it would make more waste. What you have to do : find a situation where all 4 players redirect all of their flow to their own goal. Answer with the least amount of waste squares wins. Here's one solution I found. Not the answer you're looking for? Browse other questions tagged open-ended polyomino or ask your own question.